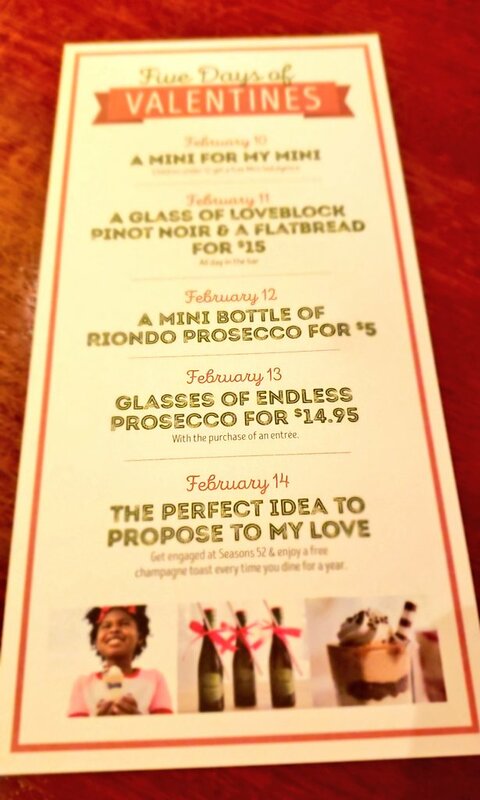 Seasons 52 isn’t celebrating just one day for Valentine’s Day, they’re celebrating for five full days! Can you feel the love? On the first day of Valentines – A Mini for Your Mini: On Sunday, Feb. 10, children under 12 will receive a complimentary Mini Indulgence. Choose from six delicious flavors, including Mocha Macchiato and Pecan Pie. 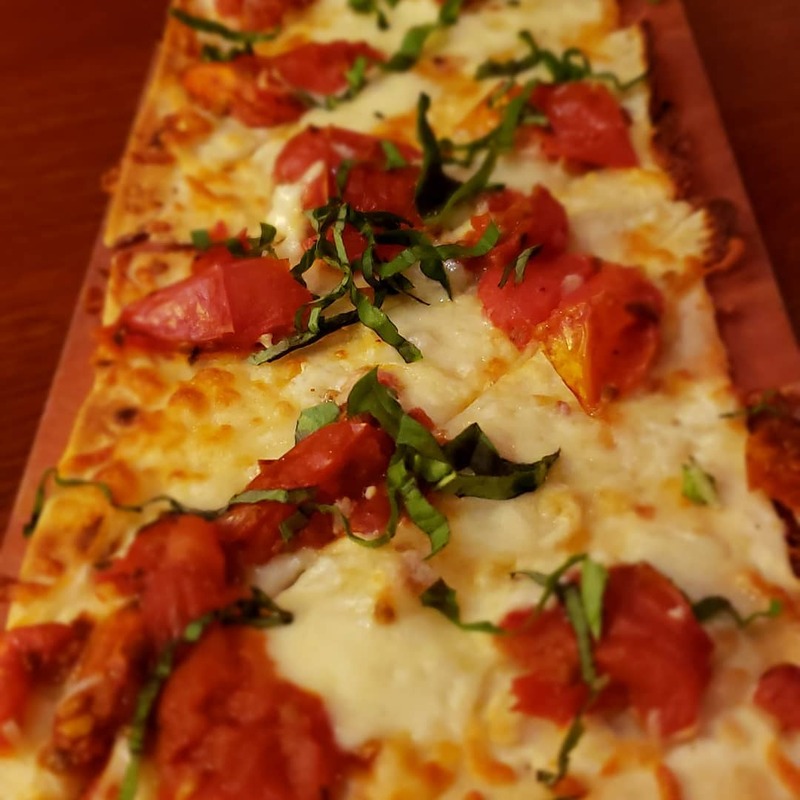 On the second day of Valentines – Wine and a Flatbread: Available all day in the bar on Monday, Feb. 11, enjoy a glass of Loveblock Pinot Noir and a Flatbread for just $15. Choose from one of six flatbreads, including Roma Tomato and Chicken Pesto. On the third day of Valentines – Galentine’s Day: Bring your girls in on Tuesday, Feb. 12 and celebrate your friendship with a mini bottle of Riondo Prosecco for everyone for $5. On Valentine’s Day – A Perfect Proposal: Get engaged at Seasons 52 on Valentine’s Day and receive a complimentary champagne toast at your special table every time you dine for one year. As usual, we never turn down an invitation to dine at Seasons 52. If you haven’t been in a while you owe it to yourself. The appetizers, wines, cocktails, main courses, MINI INDULGENCES, and service are all fantastic. Like I’ve said many times in the past, this is one of our Top 3 chain restaurants. They just do it right every time. I can’t emphasize how much we love going there. Here are a few pictures of our visit this evening. Food: Amuse Bouche (scallops w/ peppers, micro cilantro & citrus), Roma Tomato Flatbread, Wood-Grilled Handline Tuna with mint tabouli, tomato salad, preserved lemon hummus, Barbecue Meatloaf with grass-fed beef blended with mushrooms, green beans, Yukon mash, and Mini Indulgences! Wines: Loveblock Pinot Noir (New Zealand), Riondo Prosecco. If you go, tell ’em Philly Grub sent ya. Happy Valentine’s Day, my loves! Special thanks to Seasons 52 for the hospitality. Our opinions are our own. Tags: Cherry Hill Mall, Seasons 52. Bookmark the permalink.